Gunfire from Syria hits IDF jeep, Israel complains to UN. 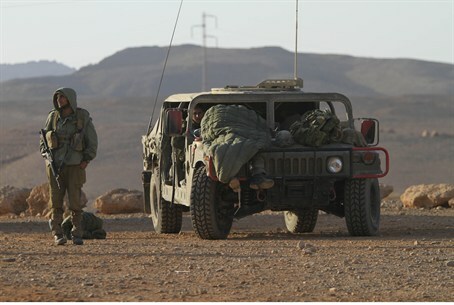 An IDF jeep patrolling the northern border was hit by gunfire from Syria on Tuesday. The incident occurred in the Ramat Golan region. The jeep was damaged, but soldiers were not hurt. The soldiers did not return fire despite new rules of engagement in the area. IDF commanders believe the shots were not aimed at Israel, but rather, were stray shots from fighting in Syria. Fighting has approached the border in recent weeks. Two misfired shells have hit the Golan region as well; after one such incident Israel fired warning shots over the border. An IDF jeep was shot Sunday, prompting soldiers to fire on a building on the other side of the border. Syrian rebels are reportedly bringing the fight near Israel’s border in an attempt to take advantage of ceasefire rules barring the Syrian army from the area. Israel responded to Tuesday’s gunfire with a complaint to the United Nations.